As you head out to run a few errands, you notice the nice sunny warm weather and look forward to enjoying the rest of the day. You are driving to the bank on a well-travelled road and vaguely notice what looks like a small dark bag on the road up ahead while you mentally go through your to-do list. As you near the dark object on the road you realize that it’s not a bag but a slow moving turtle. Your first reaction would be to slam on the brakes but there is a vehicle behind you and the driver probably does not see the turtle as your vehicle is blocking the view. You do not want to surprise the driver and be rear-ended. Instead you slow down as quickly and safely as possible while turning on your hazard lights at the same time so that the vehicle behind you is alerted to be cautious. Given that you were travelling at a safe speed and you are not on a major road you manage to stop your vehicle in time. The driver behind you, unsure of what is happening, does the same. You no longer see the turtle in front of your vehicle so you check to make sure it is safe and then exit your vehicle to find the small animal. The turtle has barely moved and you realize that it would not be wise to continue to block the lane while you wait for the turtle to finish crossing the road. It is a small, light turtle so you decide to firmly grab it on both sides of its shell and underside (the plastron), lift it up, and carry it the rest of the way in the direction it was heading to the side of the road. Once there, you gently place the turtle in the grass facing away from the street so that it can continue its journey. As you head back to your vehicle, you remember that your city is collecting information on the locations of turtle habitats in order to place more traffic signs to warn drivers of potential turtle crossing areas. You make a mental note to log the information of your sighting on the city website when you arrive at home. 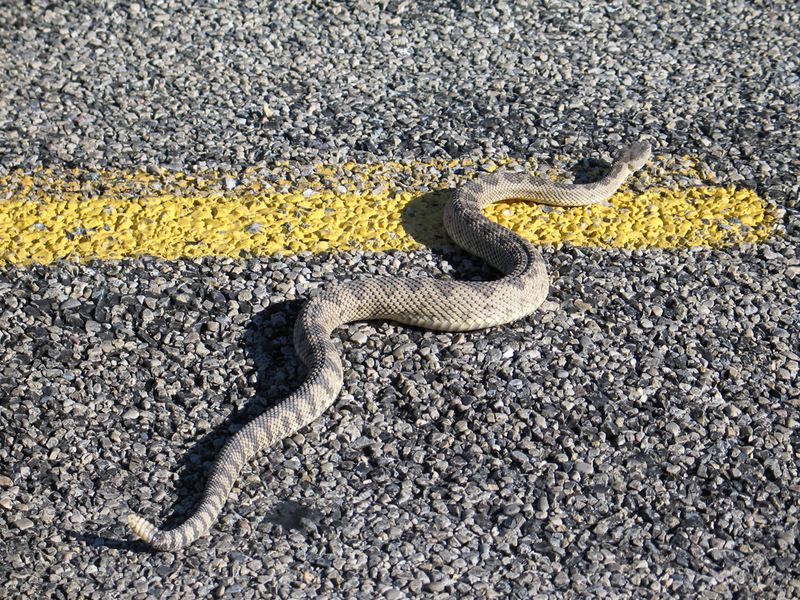 Although small and medium wildlife such as wolves, turtles, and snakes do not pose the same risks as large wildlife to vehicles, poor driver responses to smaller wildlife can be equally as dangerous. Drivers should be aware of the additional precautions described below if faced with colliding with a smaller animal. Be prepared to come across small and medium wildlife anywhere, regardless if it is an urban or rural area, and in any geographic location, as well as at any time of day or any season. Do not swerve to avoid small and medium-sized animals. The majority of crashes are caused by drivers attempting to avoid animals and instead lose control of the vehicle or crash into another vehicle or roadside hazard. For smaller wildlife, if you have no choice it is better to hit the animal rather than put your life or the lives of others at risk of injury or death. Do not slam on the brakes. Small wildlife can be difficult for drivers to see until the last minute. Be aware of vehicles around you. If a small animal suddenly appears and there are vehicles behind you, firmly press down on the brakes to slow down and turn on your hazard lights if possible. Other drivers may not be aware of the animal and may not be prepared to stop so they could collide with you. Many small and medium-sized animals such as squirrels or foxes are more agile and have greater manoeuverability than vehicles; therefore, they often can quickly dart out of the way of danger. For these types of animals, continue to drive in a straight, predictable manner, as they will be more likely to avoid you. If you strike an animal of any size, report it to the local animal control or conservation office and, if the injured animal or carcass may pose a risk to other drivers on the road, inform transportation authorities or the police/RCMP (if necessary). What characteristics of small/medium animals increase collision risks? Risks to people. Unlike large wildlife, collisions with small/medium wildlife and amphibians are typically not dangerous to drivers. Instead, the danger to road users is often caused by the reaction of the driver to the wildlife such as swerving or slamming on the brakes to avoid hitting the animal. Swerving to avoid an animal may result in hitting other vehicles or road hazards or losing control of your vehicle. Emergency braking can be equally dangerous because not all drivers may be alert to the presence of animals. Although one driver may be prepared to stop, others may not. As a result, drivers who suddenly slam on the brakes are at risk of being hit by another vehicle from behind. Those who attempt to help smaller or slower moving wildlife across roads may pose an additional danger related to road safety. Although people may have good intentions, their actions may put themselves or others at risk. For instance, stepping out onto a highway or busy road, attempting to frighten animals to make them move, using your own vehicle to block traffic, or conducting other dangerous protective activities can put you and others at risk of a crash. Assisting wildlife across a road should only be done when it is safe to do so or, if possible, by people who are trained in maintaining traffic safety such as police or the RCMP. If helping smaller wildlife will put anyone in danger then the wildlife should be left alone. Risks to small/medium wildlife. Roads pose significant risks to small/medium wildlife as they are no match for fast moving, large heavy vehicles. 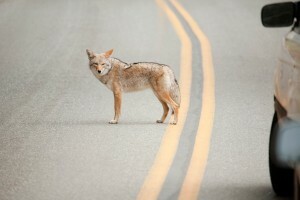 Wildlife road mortality has been listed as a substantial threat for many species at risk in Canada. 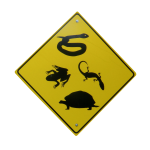 Indeed, in Ontario, 18 reptile species, three amphibian species, 10 bird species, two small mammal species, and one insect species are all labeled as at risk and road mortality has been documented as a threat for these species (Ontario Road Ecology Group 2010). Assessing the risk of roads to small/medium wildlife and wildlife conservation is difficult for several reasons. In contrast to large wildlife, collisions with small/medium animals tend to go unreported due to lack of damage to vehicles or injury to people while some drivers may be unaware that they hit a small animal. Additionally, the carcasses of small/medium animals alongside roads tend to be removed or consumed by predators more quickly than large animals, or can be difficult to find or identify. The impact of roads on mortality rates of small/medium wildlife is therefore likely to be substantially higher than what is recorded by agencies or organizations that collect this information. Roads can also disrupt natural habits, causing changes in breeding, feeding, or migration patterns. Most species of wildlife have difficulty adapting to the changes, which can cause declines in numbers. When and where are collision risks highest with small/medium animals? When? With respect to seasons, collisions with most small/medium wildlife are likely to occur during the spring and fall periods when animals migrate between their winter and summer areas. This may require animals to cross roads to reach water sources, breeding areas, or food. During the winter months, although some animals hibernate (such as most reptiles, amphibians, marmots, or hedgehogs); others may still be active (such as wolverines or the red fox) and venture into areas beyond their normal regions in search of food. 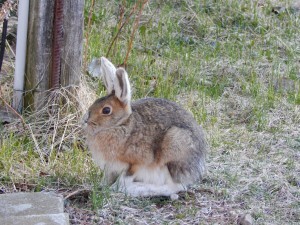 As such, though the risk of hitting smaller wildlife during the winter is lower, they are still present. For drivers, the more dangerous road conditions and less available daylight means that attempting to avoid hitting a small/medium animal can still result in a serious collision. Small and medium wildlife can be active at all times of the day or night depending on the animal, but peak times for animal activity tend to be at dawn and dusk. For instance, most squirrels are active in the morning and mid-afternoon, turtles and other reptiles may enjoy the warmth emitted from road pavement in late afternoon, while skunks and racoons are nocturnal and more likely to come across your path at night. For this reason, it is best to be alert and attentive to your surroundings at all times while driving. Where? The geographic locations where a driver is most like to have a collision with small wildlife will be dependent upon the animal. However, given the wide dispersion of small animals in both rural and urban areas, expect to see small and/or medium wildlife anywhere. For instance, drivers can come across beavers throughout most Canadian provinces and territories, but they also can be found in cities with streams and rivers such as in Greater Vancouver or Ottawa. On the other hand, other small animals might only be found in specific localized areas. Turtles, for example, are common to the southernmost areas of provinces straddling the Canada-U.S. border, or in Nova Scotia. While driving, it is important to be aware of the different wildlife signs posted along roads and highways so that you are better prepared to respond to the type of wildlife you may encounter. Like large animals, small animals also prefer to be near sources of water like wetlands, bogs, lakes, or rivers as well as foliage that provides food and good cover. 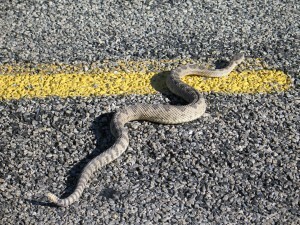 Therefore, drivers should expect to come across small wildlife in a wide variety of areas. Additionally, certain small wildlife also makes use of the road for other purposes such as some turtles which prefer to lay their eggs in the dry dirt or gravel alongside roads. Find out Why wildlife may be found on or near roads, What to do after a collision, and Road Safety and Moving Small/Medium Wildlife by checking out the Road Safety web page or download the handout/card to carry in your glove compartment.